This aerial view of Merwick Cottage shows the magnificence of this waterfront property. 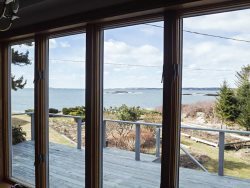 Guests love the unobstructed view of the Sheepscot Bay from Merwick`s perch above it. Pick up fresh lobsters from nearby Five Islands Lobster Co and enjoy outdoor dining on our deck. Merwick Cottage sits high above the water. Every seat at the dining table has a breathtaking view With sliding glass doors, large windows and skylights, there is plenty of natural light. The telescope offers a look at the osprey nest across the way. The living room has high ceilings and comfortable seating. Between the spacious deck and living space you`ll have plenty of room. Should there be a chill in the air you can enjoy sitting besides the fireplace in one of our rockers. A flat screen TV and collection of DVDs are also an option if you choose to stay in and relax Another view of the fireplace in our living room. We like to cook, so our kitchen is very well equipped. You`ll feel right at home There`s plenty of cabinet space to store anything you decide to pick up at the market. Our dishwasher makes cleanup a snap. Uncluttered counter space for all your culinary creations. The open design leaves plenty of room in the kitchen for helpers. Adjacent to the kitchen is a cozy breakfast nook with a view of the bay. A perfect spot for morning coffee with a paper or iPad. You`ll love the master bedroom with a view of the bay right from bed. Reading lamps, plenty of pillows and outlets for charging electronics make it a cozy place to read. Take a look in our small library for a classic, and enjoy some quiet reading time in our bentwood rocker. Bay views will surround you, contributing to the tranquility of this special getaway. Our second bedroom provides a double bed and plenty of dresser and closet space. If you come with the kids or some friends, the third bedroom has two single beds. The bathroom has storage for toiletries and abundant light. Here`s our step-in shower and a hand grip on the wall for your convenience. The lower deck is at ground level. Perhaps on your way back from the bay you`ll pause to collect your towels or watch the kids play in the yard Here`s our private dock and float. Bring your boat up to 16 feet, rent a kayak, or just sit and relax. Our back deck has such an amazing view Enjoy the lovely flowers and lush lawn on our property. Plenty of windows and comfortable seating on both decks. Due to allergies, this is a non-pet-friendly home with no exceptions. "My favorite place to walk is Ledgemere Road, just above the Five Islands wharf, running along the Sheepscot Bay for almost a mile. There is a small beach and you can walk out on the granite ledges where the surf crashes. The woods around are pine, and in the summer Ledgemere Road smells of balsam." "Sometimes, as we got older, the water from the ponds permitted a longer frolic than the ocean. Charles Pond, which is within walking distance, is cool and deep. Sewell Pond, off of Old Stage Road, and a short hike from the road through a nature preserve is a favorite, rope-swinging place to play." "My favorite time of day is dawn, when the sun breaks over the horizon - lavenders, blues, gold's, and scarlet's silhouette the trees, boats, and rocks. The songbirds' songs echo across the water from the islands. The full moon on the water is hypnotizing and relaxing. Sometimes you can get both - a rising sun and a setting moon." "My very favorite thing about Maine and especially Five Islands is the smell of the fresh ocean air mingled with pine and roses. I suppose I could be a millionaire if I were able to bottle that and sell it. There is nothing like it in all the world." From Merwick Cottage you have stunning views of the fishing village of Five Islands, the Sheepscot Bay and out to the open ocean. Head on down to your private dock and float with over 200 feet of rocky shore-front to enjoy watching the comings and goings of lobster boats and elegant yachts. Bring your own boats or rent locally for a spectacular day of exploration along this beautiful stretch of rocky coastline. Fish, swim, float or simply relax. Watch the moon rise over the bay from the cozy living room, glimmering on the surf crashing off Crow Island. You are within walking distance of the award-winning Five Islands Lobster Co. and, coincidentally, Merwick's kitchen has the needed pots and crackers to serve up a bountiful lobster dinner! There are miles of hiking and biking trails in Georgetown and more on preserved lands throughout the Mid-coast area. Head over to Reid State Park to enjoy over a mile of sandy beaches, into Bath for shopping, souvenirs, and restaurants or explore the many museums and galleries in the area. A week will fly by before you can see all there is to see, so you better book two! PETS PERMITTED? No, pets are not allowed at this property due to owner's severe allergies. LINENS INCLUDED? No, linens and towels are NOT included, however, they can be rented through us (for a fee) or brought from home. Pillows and blankets are provided. The master bedroom has a Queen Bed and sliders to an open deck with that spectacular view. An incredible spot for that early morning cup of coffee! Also on this floor are two additional bedrooms, one with a Double Bed and one with Two Singles Beds and a Full Bathroom. The open concept design includes a fully equipped kitchen, dining area and a living area with sliding glass doors to an open deck with another spectacular set of views! After a dip in the ocean, rinse off in the ¾ (shower) bathroom in the lower level! Be sure to let us help you create the perfect vacation! We love this sweet little cottage and have all kinds of ideas and information on how you can enjoy your vacation at Merwick Cottage. Reach out to us for help in planning your trip!  GEORGETOWN, MAINE is a seaside town in Sagadahoc County, Maine, United States. The population was 1,020 at the 2000 census. Home to Reid State Park, the town is part of the Portland–South Portland–Biddeford, Maine Metropolitan Statistical Area. Located on an island accessible by car from the mainland, Georgetown includes the villages of Five Islands, Georgetown, Bay Point, Marrtown, West Georgetown and Robinhood. BATH, MAINE is home to Bath Iron Works and the Maine Maritime Museum, Bath has a history steeped in the Maritimes, nautical and seafaring trades and of course boat building on a grand scale. Located at the mouth of the Kennebec River, Bath is a modern and vital community in Mid-coast Maine that has deep historical roots dating back to the original Popham Colony established in 1607. Enjoy local shops, eateries, and galleries downtown and explore Reid State Park, Popham Beach State Park and Kennebec Land Trust Be sure to check the calendar for the Summer music series while you are here! Linen - Are NOT included but may be rented for a fee, ask your reservationist. Pillows and Blankets ARE provided. Beautiful ocean and island views. The house & view are perfect at Merwick. The back yard is great for lawn games--just don't forget to use the bug spray that's provided! Although it was hard at times to reach someone when I did I found them very friendly and helpful. I thought the house and the view was very nice. I was nervous about the mention of the sulfur smell but as indicated it did disappear. Otherwise I believe it would have been a problem. When we used the heat it kept the house cozy. Loved waking up for the sunrise, lobster boats and birds!! After site seeing it was a pleasure to come back to the house and relax on the deck again. When you plan a memorable event that will last a life time, you want to have Lucy in your corner. she was unbelievable, constantly going the extra mile to insure that our special day was perfect, and it was. I have recommended her to a lot of people that are looking for that personal touch and is so lacking in this new world. By the time it was all said and done we felt that we were family, that type of person is an attribute to any company and I am sure that you feel the same. Give a hug from me and Donna to Lucy. Donna & I were looking for a place that would be spectacular in location and cozy in atmosphere. It was our wedding week and we planned to eat, drink and be merry, which we were able to do very nicely with this cottages location and the homes layout. The whole house felt like our home away from home. we had a few small issues, all minor, but all were handled by staff of Cottage Connection and they did a good job. The view was great and we had a great time! We celebrated our honeymoon in the old place in 1980 and came to Merwick to celebrate our 35th wedding anniversary. The place looks great. Many fond memories. We were able to visit MacMahan Island, where my grandmother & her family was from. A 4-NIGHT MINIMUM IS REQUIRED FOR NON-PEAK SEASON RENTALS. We require at least 72 hours notice of intent to rent so the cottage can be prepared for your stay. Arrival & Departure Days in Non-Peak Seasons may be flexible. Driving directions and Check-In information will be emailed to the guest TWO WEEKS prior to their scheduled arrival. We represent a wide variety of quality vacation rentals throughout the Mid Coast Region of Maine. Individually and privately owned, each vacation rental reflects the taste of its property owners. Every effort has been made to insure that the descriptions and amenities listed above are accurate. However, occasionally changes are made by the owners to furnishings, amenities and equipment. Once a change is brought to our attention, we will update that webpage. If you have any specific questions not addressed above, or are in search of specific criteria, please contact us.